IHG® Rewards Club - Música - K. Moraski,Karl Moraski - Azariah Loves To Draw, Her Family And Bossier City, Louisiana. Azariah Loves To Draw, Her Family And Bossier City, Louisiana. 1. 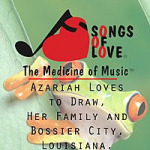 Azariah Loves To Draw, Her Family And Bossier City, Louisiana.